National Geographic is joining with dozens of bird-centric organizations, such as Audubon Society and Cornell Lab of Ornithology to celebrate 2018 as the Year of the Bird! What is the Year of the Bird? 2018 marks the centennial of the Migratory Bird Treaty Act, the most powerful and important bird-protection law ever passed. Turns out, bird watchers in the US back then saw the need for awareness and action in response to over-hunting and bird habitat degradation and destruction. Why is it so important to protect birds? You’ve heard of the canary in the mine, right? It’s not just a metaphor for dangerous mining conditions. In fact, when we take active steps to protect birds, in particular migratory birds, it turns out those actions and policies are also important for so many other aspects of the web of life. It gets downright noisy here at Nature Nooks Retreat in May, especially in early morning, with raucous migratory flocks passing through and sometimes stopping briefly. For example, we had a dozen trumpeter swans here for part of a morning one day last spring! Honestly, I sometimes despair of getting good at identifying them. It’s hard to spot them! And they all sing and call over one another! But you know, I am getting better. We’ve hosted a few birding events here at Nature Nooks Retreat, and I add a few species every year to those I can feel confident about naming by sight and sound. We are lucky to count among our friends Craig Thompson, who is an excellent – let me say amazing – birder. (See his bio below.) We are delighted that he will be offering private tours here at NNR in May, during migration. So if you want to tune up your skills, along with a friend or four, we’ve got an opportunity for you! Email or call (608-637-3928) if you’d like more info and to schedule a tour during May here at NNR. And do check into what you can do for birds in 2018 Year of the Bird. Craig Thompson is a lifelong conservationist with a keen interest in birds. For years he has worked in state, national and international bird conservation arenas. 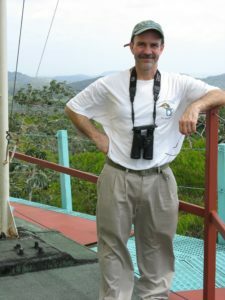 Craig holds Adjunct Faculty positions at The University of Wisconsin – La Crosse and Viterbo University and has taught ornithology, rainforest ecology and conservation biology. He serves as a Board member for the Costa Rican-based Osa Conservation, as a technical adviser for the Los Amigos Bird Observatory in southeast Peru and as founder and instructor for Bird Conservation Boot Camp. For more than twenty years he has led conservation birding tours to the wilds of Latin America. There’s nothing he loves more than connecting people to birds. Craig lives on Wisconsin’s west coast with his wife, Mary, two mischievous dogs and a yard full of cool birds.